Elite Senior Home Care can provide caregivers for seniors in need of Alzheimer’s Care and suffer from memory, thinking, and behavior impairments. Caregivers specialize with individuals who are no longer able to take care of themselves or communicate. Schedule specific programs to bolster memory and mental stimulation. There are no specific licensing requirements for an Alzheimer’s Care facility. However there are many requirements for a Elite Senior Home Care – caregiver. It is vital for you to know what to look for. The following information explains a few of the top ways for you to determine whether the Alzheimer’s Care facility, or a professional Caregiver would be a good fit. First things first. 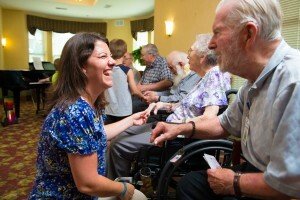 Make sure you visit the Alzheimer’s care facility to get a real feeling of how they operate. When you visit, make sure you pay attention to whether the Alzheimer’s Care facility is on a busy street or in a quiet neighborhood. Quiet residential neighborhoods reduce the possibility of wanderers being victimized, overwhelmed, or even hit by vehicles. The Alzheimer’s Care facility should also be quiet because patients with Dementia can easily have sensory overloads from too much noise. Several Alzheimer’s Care facilities house other patients in the same unit. Dementia patients have specific and different needs. It’s best the facility houses these patients separately. If there is too much interaction between Alzheimer’s patients and the other patients, it could disturb both groups of residents. The Alzheimer’s Care unit should also have special measures in place to ensure the patients are not able to leave undetected or escape the unit. The patients may be required to wear alarm bracelets. Make sure the exit doors are locked. These measures are important because it’s a matter of safety. It’s best if the unit is a smaller. Home-like units are best because Dementia and Alzheimer’s patients are easily confused in large institutional settings where everything can appear to be the same. Many assisted-living facilities feature long halls with dead ends, and these patients need circular areas designated for them to wander. Dead ends have a tendency to frustrate Alzheimer’s patients. It is also important that the unit is all on one level. This will reduce the risk of them falling and becoming disoriented. Large calendars and clocks to help the patients stay oriented in time, schedule, and season. Locator signs and graphics to help the patients know where they are going. Simple and bold color schemes. For instance, the hallway should be in a single contrasting color and all bathroom doors should be the same. Deciding what is the best care for your loved ones can be a difficult decision. For more information about caregivers from Elite Senior Home Care. Please contact us today!